Also: For many years, madcap merriment and music machines delighted guests at Svoboda’s Nickelodeon Museum in Chicago Heights. What happened to that odd assortment of instruments? Was there a time when the Chicago Motor Club posted traffic signs in the public way, as opposed to the city’s department of public works or transportation? 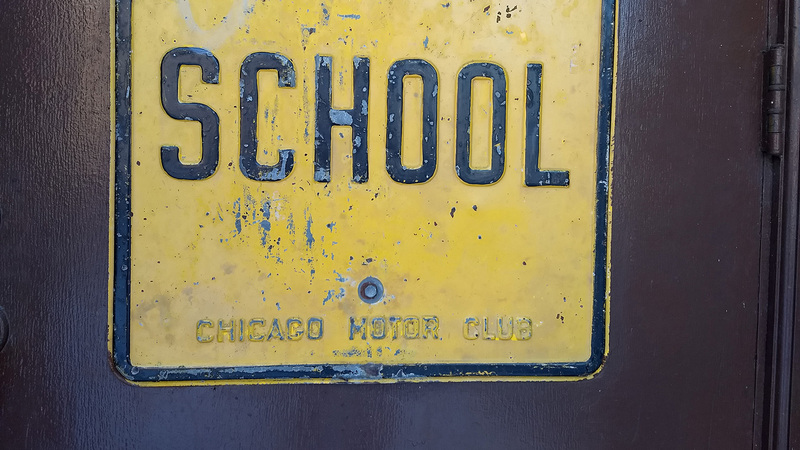 There is a sign now bolted to the door of a school in Rogers Park, but it appears as if it were once a public way sign, and it’s marked Chicago Motor Club. For many years, the Chicago Motor Club did post signs like this one our viewer saw in Chicago and outlying areas, particularly around schools. Now of course all traffic control signage in the public way is handled by government, and under an Illinois law passed in 1967, anyone caught erecting traffic control signs visible from the street would be fined. But when the country was just entering the age of the automobile at the turn of the 20th century, public streets were a lot like the Wild West, with very little regulation. Automobile clubs began forming across the country, and in 1902 nine of them met in Chicago to form the American Automobile Association. But they were basically sporting clubs. As the club grew, they began agitating for road improvements, creating maps, offering travel advice and roadside assistance to members, and posting all sorts of cautionary road signs. Educating kids about safety around cars was a special focus. The club started “schoolboy safety patrols” and provided routes to schools that they deemed safest for kids to walk. Ironically, in 1965 the Chicago Motor Club’s safety director said that the profusion of signs around suburban schools was making school crossings chaotic, confusing, and unsafe. That’s about the time that the Chicago Motor Club exited the sign-making business. For many years the club was headquartered in a 1928 17-story Art Deco tower on what is today East Wacker Place. It offered members a place to get all kinds of assistance and driving information, like TripTiks – custom driving routes that Chicago Motor Club members could get from trip planners. Today the Triptik is a mobile app, but you can still get them printed for you if you stop into your local Chicago Motor Club office. The Chicago Motor Club building was renovated as a Hampton Inn in 2015, and most of the motoring-themed silver ornament was retained, along with a glorious 29-foot-high John Warner Norton mural showing the U.S. highway system as it was in 1928. Though it has been affiliated with AAA since 1906, the Chicago Motor Club operated as an independent club into the 1980s. Today it’s known as AAA-Chicago Motor Club and its offices are in Aurora. A night at Al Svoboda’s was always magical and memorable, a maze of penny fortune tellers and 10-cent player pianos. What was the story of the place, and what happened to the collection after it closed? Al Svoboda’s Nickelodeon Tavern in Chicago Heights was indeed full of mechanical music machines and other contraptions. The bar got its first music machine sort of by accident: the owner accepted it in lieu of a $7 payment for a barrel of beer. The original proprietor, Albert Svoboda, opened it as a regular neighborhood saloon in 1908 back when Chicago Heights was mostly farmland. Albert’s son Al started tending bar at just 13 years old. When his father died in 1922, young Al and his mother Anna steered the bar through Prohibition by secretly making wine in the basement. Al Capone supposedly supplied their beer. In 1934 the younger Al Svoboda took over operations, and that’s when that first music machine enters the picture. It was a hit with his patrons, and his hobby collecting similar instruments and an odd assortment of antiques began. Over the years, Svoboda amassed a collection of over 60 music machines, including an 11-foot-tall Belgian Luxor Decap dance organ that replicated a 10-piece band. He added coin-operated peep shows, antiques and game machines to the collection as well, and he employed technicians to tune and maintain everything he couldn’t. Most of this history comes from one of those technicians, Art Reblitz, who wrote his account for the Journal of Mechanical Music in 1989. Reblitz fondly recalled Svoboda’s zany ‘60s heyday, where Al Svoboda would stroll through the tavern and delight patrons with jokes, magic and musical performances, sometimes on an instrument Svoboda himself invented called a Zingaboom. And the entire tavern was loaded with gimmicks like penny-pitching games and mechanical gags for unsuspecting guests. In 1966, Svoboda built a new place in nearby Lynwood, Illinois, and gradually moved the machines and mechanical gags there. But the new location wasn’t as successful as the original, and Svoboda’s Nickelodeon closed for good in 1982. The instruments that so captivated Svoboda’s fans were sold off to collectors all over the world. Some are close to Chicago. The Decap organ, a Zingaboom, and a few other machines from Svoboda’s are in the Sanfilippo Estate in Barrington, which Chicago Tonight visited in 2009. And a Welte barrel orchestrion is at the famous House on the Rock in Wisconsin. While we’re on the topic of nickelodeon taverns, we also received a question from a viewer who remembered another nickelodeon tavern at Milwaukee and Armitage, but couldn’t recall the name. That one was called Valente’s House of Nickelodeons. Reblitz tells us that it had about a dozen instruments, but was not as successful as Svoboda’s and it closed sometime in the 1960s before he had a chance to visit it. Valente’s was not as well-documented at Svoboda’s – all we could turn up was the postcard below. Note: This edition of Ask Geoffrey first aired on “Chicago Tonight” on April 4, 2018.